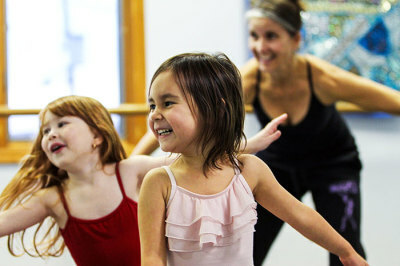 Ballet Arts’ Classes for all ages and all experience levels. THE CHILDREN’S DANCE PROGRAM runs from September until June, with breaks for school closings and holidays. Class placement is based upon age, ability and maturity for the purpose of the individual dancer’s progression, and is at the discretion of the directors. Our core focus is primarily on ballet technique, which is fundamental to dance. Although our name says Ballet Arts, we also offer many other exciting dance forms and encourage all students to study other disciplines, which will aid in the development of a technically strong and versatile dancer. Students learn poise, spatial awareness and dance movements to set musical phrases and rhythms. 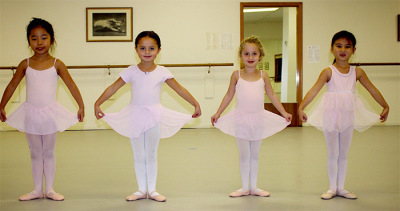 Here they learn the beginnings of ballet, concentrating on basic positions and movements, imagination and having fun. Students at this level are now familiar with ballet class structure and etiquette. Training increases to 2 classes a week. Students build upon their knowledge of positions and vocabulary. Emphasis is on posture and laying the foundation for good technique. Students should have a knowledge of the basic vocabulary and theory of the previous levels. With more formal barre work, they strengthen and develop their skills. Different types of movement and body directions are introduced. Students should have a working knowledge of ballet terminology. Combinations for the floor exercises increase in level of difficulty, training the dancer’s comprehension of choreography. Students at this level now learn to execute more difficult movements. Students should have a proficient knowledge of terminology and movements. Here they work on technique, and continue to learn more complex movements and combinations. Students have completed up to level 4 and are in high school. Here they continue to refine technique, while challenging their choreographic comprehension with different styles and variations. Students gain valuable stage experience from an early age and create wonderful memories in Ballet Arts’ two annual productions – The Nutcracker in December and another performance in May. Tap dance is a form of dance characterized by using the sounds of tap shoes striking the floor as a form of percussion. Focus is on the fundamental technique, vocabulary and rhythm. Students start with a warm up, exercises across the floor, and center combinations suited to each level. Students ages 10 and up learn different contemporary styles of dance that are age appropriate. Starting with a thorough center warm up including stretches, isolations and core strengthening, followed by movements across the floor and then a center combination, students are challenged to move through various dance styles. Modern Dance allows for immense creative and artistic expression through its value of individuality and creativity. This class will introduce students to elements and principles of modern dance technique, including the fundamentals of contraction/release, spirals, weight shifts, and floor work. Students will focus on generating movement from their internal sensations moving outward, encouraging the use of breath and focus. Class will begin with traditional modern floor work exercises, and will progress into standing exercises which build core strength, moving into traveling sequences and combinations. This class is influenced by Cunningham technique and also draws from elements and principles of release technique and contemporary forms. Students learn technique and alignment through a ballet and jazz warm-up to achieve a strong and solid foundation. Throughout class students will study different broadway choreography and how it is the expansion of expression by learning character development. Specifically for boys, this class is for anyone looking to improve their performance as an athelete. The class focuses on improving balance, flexibility, confidence, strength, speed and discipline. Incorporating a complete body workout with cross training set to music will help elevate your son's performance on and off the field. THE MOVEMENT PROGRAM FOR YOUNGER CHILDREN & TEENS ​runs in 12 week sessions throughout the year. Children discover movement qualities and dynamics through imagination and music. Students learn basic class etiquette, learning to take turns and group participation. This class is for the student who wants to learn hip hop but can't committ to the full year. It allows them to experience dance in a non-competitive atmosphere and reep all the benefits that hip hop dance has to offer. This yoga program is an opportunity for teens to connect, encourage, accept, strengthen, and celebrate themselves and each other. Through traditional yoga poses and relaxation techniques, teens are given time to appreciate their bodies, listen to their own thoughts and calm the turbulent waters of their energized spirit. Through breathing practices and movement, they take skills with them off the mat and into their real life. THE ADULT PROGRAM runs year-round, with a break around the New Year and in August. Classes are interchangeable for schedule flexibility. When it comes to building strength, grace, flexibility and tone - ballet is one of the best physical and mental workouts around! Ballet improves your posture and alignment, creates a general ease of movement, and improves your balance, which are all vital in staying healthy! Ballet class gives you the opportunity to reduce stress levels, work your mind, move with beautiful music, express yourself in an artistic manner and gain confidence. Learn the basic fundamentals of proper technique. or brush up your skills if you have prior experience. Wear comfortable clothes to move in and ballet slippers. All levels - Beginners welcome! Ballet Arts' Barre class is a total body workout designed to rapidly strengthen and sculpt muscles. It concentrates on universal challenging areas: hips, thighs, seat, abdominals and arms. BA Barre is low-impact, protecting your joints; uses a ballet barre for balance; incorporates your own body weight for resistance; combines strength segments with stretching to create long, lean, toned muscles without bulk. The benefits of the BA Barre workout are accessible to individuals of varying body types, ages and fitness levels, and can complement your other fitness or sports regimens. Wear comfortable clothes to move. No prior experience needed - Beginners welcome! Learn the fundamentals of tap and explore rhythm with your feet! Ballet barre warm-up, stretch and then tapping all sorts of rhythms across the floor and fun combinations. A great workout for the heart and mind! Developed by Joseph H. Pilates in the 1920’s, Pilates is a system of exercise that targets the deep muscles of the abdomen and spine to strengthen your body from the inside out! Pilates strengthens the “postural muscles” – the internal, stabilizing muscles of your body – so that your posture, balance and core strength all improve. Whether you’re a beginner or an advanced yogi, we welcome you to any of the yoga classes. Based on classical yoga teachings in the Jivamukti Method as relevant to one’s life on and off the mat, the class includes breath awareness, flowing vinyasa sequences, alignment exploration, hands-on assistance, chanting, relaxation and meditation. Pay in full by September and receive a discount. Pay in 3 installments – due Sept. 1, Jan. 1 and April 1. May be used in any adult class on the schedule – ballet, tap, barre, pilates, or yoga. Class series expire 3 months from time of first class. Unused classes may not be used after expiration date. Special case drop-in rate $20 per class.